Eight days after Russian-built rocket crashed destroying a Japanese satellite and spreading toxic chemicals, the country has launched scientific satellite into orbit aboard a Soyuz rocket Friday. The Soyuz-U rocket lifted off from the Baikonur cosmodrome in Kazakhstan at 3 p.m. (1100 GMT) and arrived at a geostationary orbit eight minutes later, said Alexander Vorobyov, spokesman for the Federal Space Agency. During its 12-day mission, the satellite Photon will conduct nearly four dozen experiments set up by European, Russian and Chinese scientists to study bone tissue cells, protein crystals and other areas. Several of the experiments also include measurements on butterfly pupae, snails and geckos. Earlier this week, Kazakhstan suspended all launches of Russian-built Proton rockets, following a crash that destroyed a Japanese communications satellite and spread toxic chemicals over the Kazakh steppe. The crash on Sept. 6 was the second time in the past 14 months that an unmanned Russian rocket launched from the Russian-leased cosmodrome has strewn rocket fuel and debris. Russia has been aggressively trying to expand its presence in the international market for commercial and government satellite and space-industry launches, though its efforts have seen several high-profile failures. 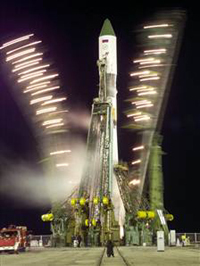 Russia pays US$115 million (EUR94 million) annually for the use of Baikonur under a deal effective through 2050.